HCM CITY — A roadmap with strategic targets and specific initiatives is needed for HCM City to become an innovative business hub in Southeast Asia, speakers said at an international economic forum held yesterday. More than 600 local and international experts, scientists, academics and representatives from local and foreign businesses took part in the HCM City Economic Forum, the first of its kind organised by the city government. In his opening speech, Nguyễn Thành Phong, chairman of the HCM City People’s Committee, said the city was implementing a project to become a smart urban area by 2020. Under the plan, the city’s eastern area, including districts 2, 9 and Thủ Đức, will be developed into an innovative hub based on a digital and knowledge-based economy. With adoption of Resolution 54, which allows special policies for HCM City, including more financial autonomy, the city now contributes 23 per cent to national GDP, 30 per cent of State revenue, 16 per cent of industrial output, and 15 per cent of exports. To build an innovative urban area, the city, which has nearly one-third of the country’s enterprises, needs strong cooperation between the state, enterprises, scientists and investors. “Enterprises play a key role in enabling innovation and startup activities,” Phong said. Nguyễn Thiện Nhân, secretary of HCM City Party Committee, said the city had great potential for innovative urban development. The eastern part of the city has great potential for education, science and technology application, with 16 universities and more than 500,000 students, which is an important factor for innovation, he noted. 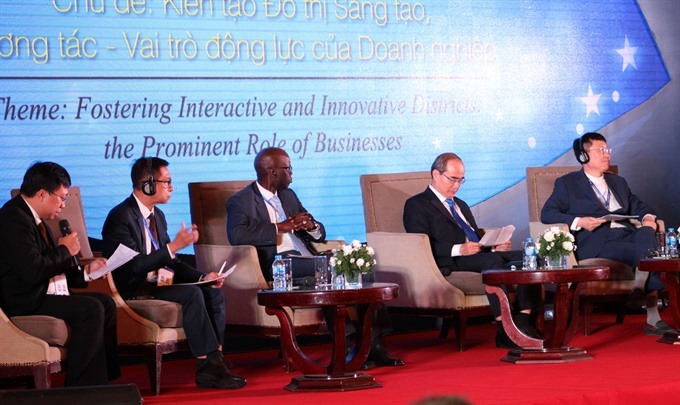 Huỳnh Thành Đạt, director of HCM City National University, said that “innovation districts” would include a high density of creative and startup activities. "Experience from other countries shows innovation districts are associated with research universities, which supply entrepreneurs, subjects of innovation, and startup activities," he said. Building an “innovation district” should be viewed as a “roadmap” rather than a specific destination, he added. According to Nguyễn Kỳ Phùng, deputy director of the city’s Department of Science and Technology, exemplary models from developed countries like the US, Japan, and the EU, and emerging economies such as South Korea, Singapore and Taiwan, all show that relationships between the state, enterprises, scientists and investors play an essential role in the “smart economy”. Jay Wadhwani, chief operating officer of Mitsubishi Heavy Industries Asia Pacific, said in order to improve innovation capacity of enterprises, it was important to think of solutions for sustainable growth. “With the region urbanising at an unprecedented rate, changes in consumption are helping to drive rapid growth. Both the public and private sectors need to ensure that this growth takes place in an environmentally sustainable way,” he said. Sustainable growth also requires an appropriate standard of living, with issues such as traffic and waste management addressed, according to Jay. Significant investment in integrated solid waste management processes and facilities, such as waste-to-energy systems, is also needed. With its rapid growth and high population density, HCM City faces many challenges, including housing, traffic congestion and inadequate sewerage system. A challenge for both the city and Việt Nam, as an emerging economy, is the shift to private businesses and a market economy from long-standing state-owned and operated sectors, according to Wheeler. The current growth rate in Việt Nam is still strongly driven by foreign investment, a high-growth labour force and local projects, many of which are in agriculture. “There is a need for a strategy to shift the economic structure towards advanced industry and services, which would need a smaller labour force with higher technological competencies and innovative thinking,” he said. For emerging economies, this transition demands a significant focus on improving education and skill-building for the labour force, according to Wheeler. With a rapid advancement of technology, the key question for an emerging economy is how to support tech companies so they can find a solution for challenges and help them commercialise solutions in a sustainable way. A strong startup ecosystem needs cooperation between stakeholders, including businesses, researchers, government and investors. According to the 2018 Global Startup Ecosystem Report, an ecosystem evolves through many stages. Việt Nam is in the earlier stages and needs to create a strong foundation before expansion and globalisation. “There have been a lot of activities within Việt Nam’s ecosystem but we need to focus on improving their quality before expanding them,” he said. 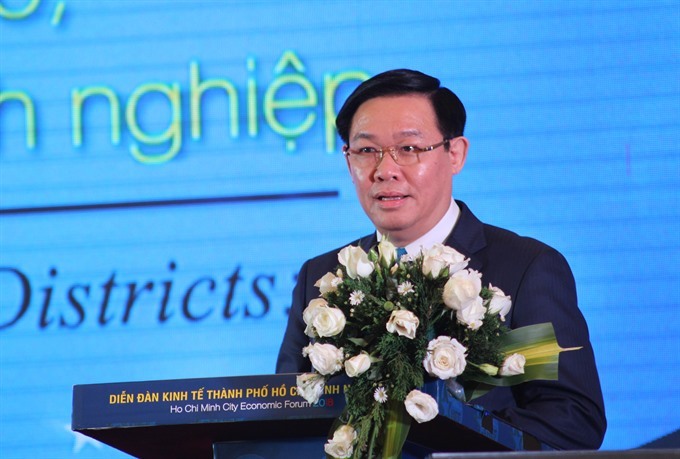 Deputy Prime Minister Vương Đình Huệ told the conferees that the Government would continue improving growth quality and competitiveness through healthy economic restructuring. The country would also ensure a favourable business environment and encourage start-ups, innovation and smart-city measures. Huệ urged HCM City to address problems in infrastructure, human resource development, and administrative reform, as well as climate change and population growth. "The city needs to maintain macroeconomic stability, control inflation, and promote GDP growth," he said, adding that this would ensure social security, job growth, higher income, and quality of life for its citizens. With the theme “Fostering Interactive and Innovative Districts: the Prominent Role of Businesses”, the forum featured speakers from respected companies, organisations and educational institutions around the world.